Monty Roberts Dually Halter Extra Small Green Nylon Headcollar. With how to use it DVD. Home / Monty Roberts Dually Halter: Extra Small Green Nylon Headcollar. With how to use it DVD. Monty Roberts Dually Halter: Extra Small Green Nylon Headcollar. With how to use it DVD. Monty Roberts patented his Dually Halter after designing a way to make it easier for horse, handler and halter to work in partnership. Your horse will teach himself to come off the gentle pressure of the soft, round nose band on the halter when asked, both forward and back. Horses find the halter’s comfortable sweet spot and move with you to maintain it, without pain, knots or poll pressure. 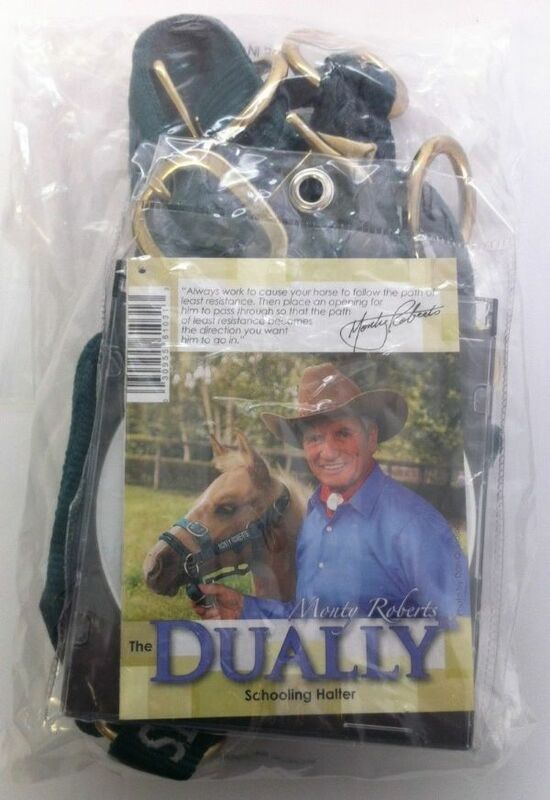 The Dually Halter comes with a DVD, booklet, and was originally patented by Monty as dual purpose equipment for leading and horse-healthy lunging or long-lining. Horse trainers have found this halter is a gift in many ways to help train trailer loading, standing still and as a bit-less bridle for riding in tack. The halter is designed with an adjustable double noseband and left and right side training rings for horse training in Monty’s natural horsemanship Join-Up way. 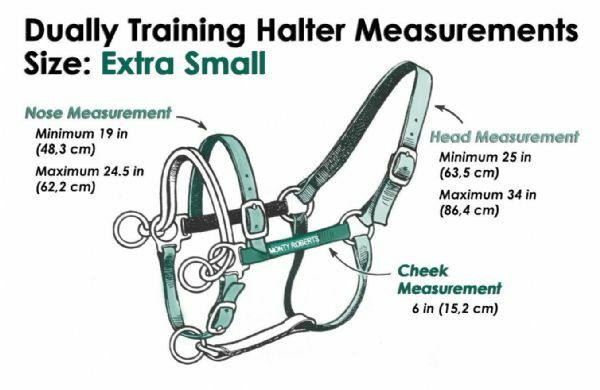 It has three points of adjustment making halter sizing precise. Monty’s halter has five sizes for a wide range including the mini horse, yearling, pony, Arab, mustangs, cob, warmblood and draft horse. The halter suits most horses for starting the young horse and riding, especially if they haven't been going well in bits. The halter can also be used as a normal headcollar for tying up when using the fixed ring at the bottom under the chin only, but should never be turned out with the halter on.